When it comes to holiday baking, I really do not try to bake “low fat” or “low calorie” as I find many of these “healthy” recipes just do not meet my cookie standards. This year, I decided to make a simple coconut and almond macaroon cookie that was studded with dried cranberries and pistachios that I found on the Eating Well website which looked healthier than many cookies, but still had lots of flavor. To finish the cookies, I drizzled the tops of the cookies with some dark chocolate which really made them really special. These cookies were delicious, and my family all loved them this past Christmas. The cookies are very tender, yet have some texture in every bite with the addition of the cranberries and pistachios. I stored my cookies in an airtight container in the refrigerator and they were still very good after one week. These cookies are also gluten free since the coconut and almonds hold the cookies together in place of flour. Fat free sweetened condensed milk and unsweetened coconut are used. Ground almonds and pistachios add nutritional value to every cookie. Almonds are high in monounsaturated fats, the same type of health-promoting fats as are found in olive oil, which have been associated with reduced risk of heart disease. 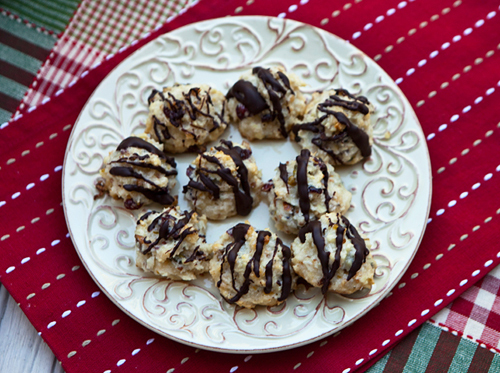 A healthier holiday cookie that is packed full of flavor. Preheat the oven to 325 degree F. and line two baking sheets with parchment paper. Whisk together the condensed milk and almond extract in a medium sized bowl. Place the almonds into a food processor and pulse until finely ground but not pulverized. Add the almonds and coconut to the condensed milk and stir until mixed. Add the cranberries and pistachios and mix well. Beat the egg whites with an electric mixer on medium high speed until soft peaks form. Fold half the egg whites into the almond mixture, then add the remaining egg whites and gently fold them in as well. Drop 1 heaping teaspoon of dough onto the baking sheet, and use your fingers to gently shape it into a mound. Continue to use up all of the dough in this manner, placing the cookies 1 inch apart. Bake the cookies for about 20 mins, or until they are lightly browned and just barely firm to the touch. Melt the dark chocolate in the microwave or in a small double boiler, and then use a spoon to drizzle some chocolate over the tops of the cookies as shown in the photo. Store in an airtight container in a cool place (or refrigerator) for up to a week.